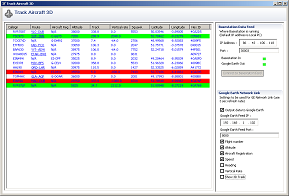 This utility converts a recorded BST log file into KML files ready for viewing in Google Earth. This JAR script converts socket output into KML files for live viewing in Google Earth. A multi purpose program providing squawk decodes, alerting on squawks and a feed to display data in Google Earth. SquawkBox conveniently fits in the empty space at the top of the RadarBox or BaseStation display which means that it is possible to access all the functions of your RadarBox or BaseStation software while SquawkBox is running. 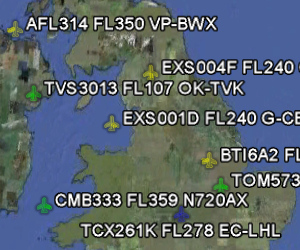 Squawk Decode - Squawkbox decodes codes and displays these (or callsign) together with the allocated ATC service. The program can read both live flight data on port 30003 and BST pre-recorded flight data files as they are being created. You can filter out squawk codes that you are not interested in. Alerts - Users can set alerts for a particular squawk code (or block of codes). Alerts can trigger visual and/or sound alerts. 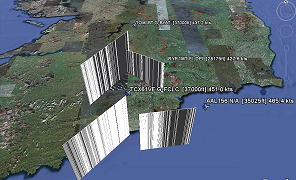 Google Earth - Squawkbox can send port data to a KML file so traffic can be viewed in 3D in Google Earth. This excellent utility will capture SBS port data and record maximum ranges aircraft are picked up for varying altitudes. It is ideal for determining your SBS coverage and to check coverage variation after upgrading your hardware. ACARSD is a free ACARS decoder that can also process Mode S data from SBS. When first released ACARSD provided much additional data (including photographs and routes) not available in BaseStation. Despite these now being provided from other utilities ACARSD is still well worth exploring. 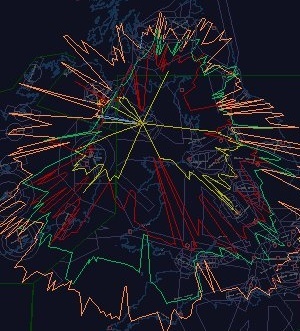 PlanePlotter is a network program designed to show aircraft from many SBS users on a single display. This neat utility will give a decode of the current METAR data for a selected airport. Just enter the ICAO code. Moving or changing data columns in the Aircraft List is a difficult procedure involving rather painful editing of the INI file. BS Aircraft List Configurer (BS ALC) allows you to change the Aircraft List order by simply dragging the columns into the order you want. BS ALC allows you to add many of the columns that have not been available in the Aircraft Listing by default - such as Operator, Serial Number and PopularName (used by several programs for recording and displaying Route data). The SBS3 SDR tuners can be used to monitor ACARS frequencies but Basestation has not been adapted to process the received data..
Stuart has written this neat little utility to fill the gap. By tapping into the SQB database this aircraft list mimics the Basestation Aircraft List display but will show ACARS derived data only. BS Recording Search application enables you to extract certain records out of a BST recording file and create a new smaller more manageable recording file containing only the required records. After you have run this program, the new file can then be played back using the standard SBS-1 Basestation - Play Previous Recording option. Records can be extracted based on Mode S code, Callsign (Wild cards allowed) or a specified time period. For each of the options above it is then possible to 'speed up' the output so that when you play it back it appears at 2, 5 or 10 times faster than the original speed. BSTChart allows users to open BaseStation recording files (BST files) and view the flight data of all aircraft in the BST as a chart similar to an FDR trace. 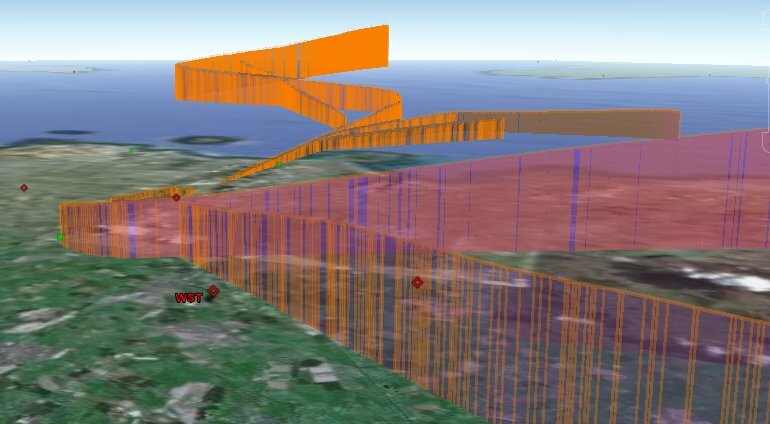 The chart can be saved as a GIF or converted to a KML file for viewing in Google Earth as a flat or 3D flight path. The Settings menu allows the display of aircraft information from your SQB file, route data (taken from either FD or AD) and pictures if stored on your HD. Altitude can be adjusted from a Flight Level value to height AMSL if the QNH is known. 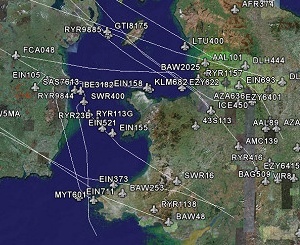 The screenshot below shows several Dublin arriving and departing flights exported from BSChart into Google Earth. SBS Meter Lite reads BS socket output and displays blue LEDs representing number of msgs/sec (MSG1 to MSG8). Updates every 5 seconds. SBS Meter Lite can create a text log in the application folder. If enabled then every 60 seconds SBS-1 Meter dumps data to the log as average msgs/sec for the last 60 seconds for each type of MSG. SBS-1 Meter Chart is a separate program that can read the data logs, either historical data or in real time. BSPhoto reads the SBS socket output and displays photos from your HD (thumbnails about 200 x 133 pix) of the 8 most recent aircraft detected. Supported extensions: jpg (tested) and gif (not tested). Up to nine columns of aircraft can be displayed. The first column shows all aircraft picked up by the SBS and the remaining eight can be filtered to users preference. Columns can be filtered on ICAO code, Registration, User Tag, Mode S code, Logo or Interested. Wildcards are accepted so a Mode S code of 43C will display all UK Mil aircraft received..
All user columns can be turned on/off as required. All filters can have an audio alert set. BSPhoto can also show three additional displays. Pressing F2 will display a graph of the aircraft types and their frequency. Pressing F3 will display a graph of aircraft operators and their frequency. Pressing F6 will show a new photo panel which will display the aircraft (and values) for the fastest and highest aircraft and those with the greatest rate of climb or descent. Overflight Logger is an Excel spreadsheet that can watch for aircraft within a specified radius of your SBS unit and can also log aircraft for a separate defined radius. It produces graphs for Max Range, Max % Horizon, Min Altitude and Min Elevation plus a 2D plot showing lowest altitudes recorded. A drawing tool for creating outline files. The picture window opens Google Maps and from this a line, or series of lines, can be drawn and the code generated can be copied into an outline file. The program is ideal for creating airfield plans (if the Google map resolution is good enough) but can also be used to draw coastlines, roads or anyother map features. A simple lookup program to return route information from an aircraft's flight number. BSAlert is a stand alone Windows program that can notify you of a specific Mode S code, a squawk or even blocks of squawks. BaseStation needs to be running otherwise port 30003 data will not be received. SBSResources has been designed to make some of the add-on programs and data easier to install. It also includes some additional material not available online - particularly a set of high resolution and very highly detailed airfields plans.